We offer you a professional meeting place, fulfilling all requirements for your event. 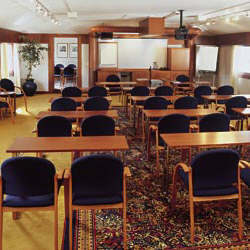 Our recently refurnished and decorated conference room is equipped with the very latest technical equipment. Bring your PC, plug it in and control the video beam, screen, TV, light and curtains from the remote control.You may chose between several other nice facilities at competitive prices. Groups from 6 to 60 persons. Contact us for a good offer with optional rooms or dinners.